Portland’s Multnomah civic stadium opened to the public for the first time on Saturday, October 9, 1926 (Morning Oregonian, 8 October 1926). 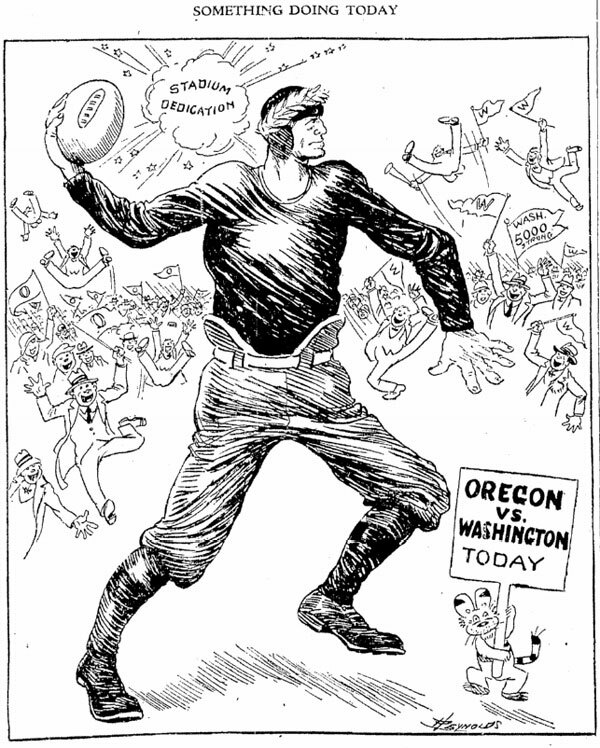 The occasion of its dedication was a football game between the University of Oregon and University of Washington. Washington sent two special trains conveying 1500 students to the game. About 2000 Oregon fans arrived the night before on special trains from Eugene for a Friday night rally and parade. The stadium gates opened at 11:45am and the first order of the day was a concert by the Washington high school band, followed by another by the University of Washington’s. Disabled war veterans were honored guests at the game. Grammar school children who bore letters of identification from their school principals were entitled to special $1 tickets. At 2:15pm the teams took the field and at 2:30pm Portland Mayor George Luis Baker ceremoniously placed the ball for the opening kickoff. Twenty homing pigeons, carrying purple and green streamers, and bearing messages to mayors of 20 towns in Oregon and Washington, were released from the field. 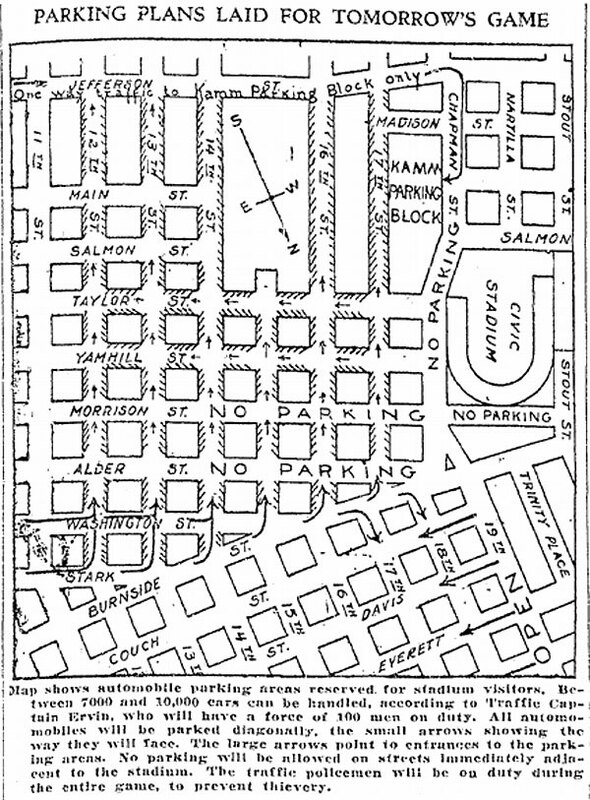 Unfortunately the Huskies came out on top, 23 to 9, and their fans staged a victory parade to downtown after the game (Sunday Oregonian, 10 October 1926). Nevertheless, the stadium’s debut was considered a huge success (and the atmosphere was apparently much like a Portland Timbers game). 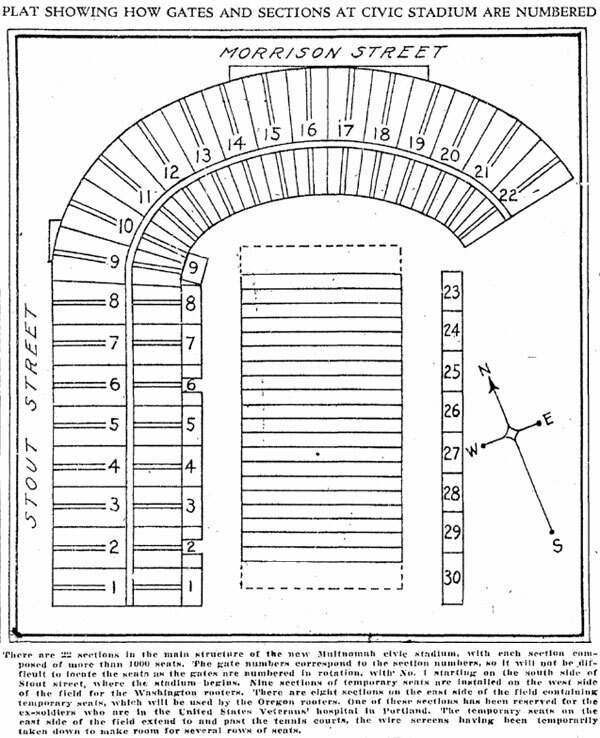 Crowds, clamor, color, combat – and Portland’s stadium was dedicated, a massive symbol in concrete and steel of civic pride . . . Call it pep, call it spirit or enthusiasm, one couldn’t have bought it yesterday for a million. The stadium brought it. So that is what the stadium means – pep, spirit, in amount incalculable. Inside the huge amphitheater was enthusiasm in concentrated form – 27,000 cheering, waving dynamos of seeming super-man power energy. But all enthusiasm was not concentrated there by any means. It radiated over the city, was manifest on the streets, in the stores, wherever two more more people gathered.